Blairsville, Georgia. Peaceful Creek Cabin in North Georgia Mountains. An acre of creek front privacy in the North Georgia Mountains! Just two hours north of Atlanta and five miles north of Blairsville, this vacation rental cabin is located on an acre of picturesque private property with end of road privacy, and is bordered by the national forest service. 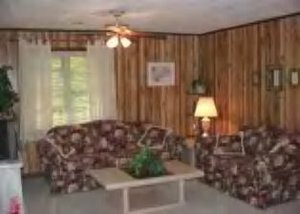 With all the comforts of home including central heat & air, comfortable king and queen beds, full kitchen, and screened porch area, the cabin is easily accessible and close to Blairsville shopping and restaurants. Enjoy the sounds of the creek from the open upper deck, relax by the stone fireplace inside, or picnic at the private picnic table by the creek. The large front yard has a park like setting and is fronted by Reece Creek. Travel just 30 minutes west for a great train ride through the mountains, 40 minutes south to Helen, GA, 30 minutes north for whitewater rafting, or enjoy the local waterfalls and scenery. Vogel State Park and the Appalachian Trail are 20 minutes south, and horseback riding, tubing, and gold panning are nearby. Bring your groceries and personal items and lock yourself away for a truly peaceful experience in the North Georgia Mountains!